We took a trip to see Chase for 4 days this past weekend. We had so much fun! We drove up on Thursday and it definitely wasn’t a fun drive. The sun was in J’s face for about an hour so at first I put my hand up to block it, but that got old pretty fast. I ended up stopping at Starbucks for a Pumpking Spice Latte to reward myself for surviving 45 minutes of screaming/fussing/complaining, and I draped a blanket over the front seats in an effort to block the light. It worked! And then 15 minutes later the sun started to set. Ah…at least we survived the trip. J got to stay up way past his bedtime each night we were there. He had so much fun though and he was in such a great mood. We were having too much fun as a family to enforce bedtime. I think that is totally acceptable. On Friday we had lunch with my Aunt and Uncle and then later that evening my other Aunt dropped by to say hi. Chase and I decided to go out for Italian food as a treat for dinner. We planned on eating cheaply the rest of the weekend. Italian food is my favorite! J did great at the restaurant. I packed his bag with toys so while we were waiting on food or even during eating, we played with cars, straws, spoons, etc. That is how you survive eating out with a 20 month old! On Saturday we went to a farm nearby that has all kinds of neat things for kids. J had a blast! 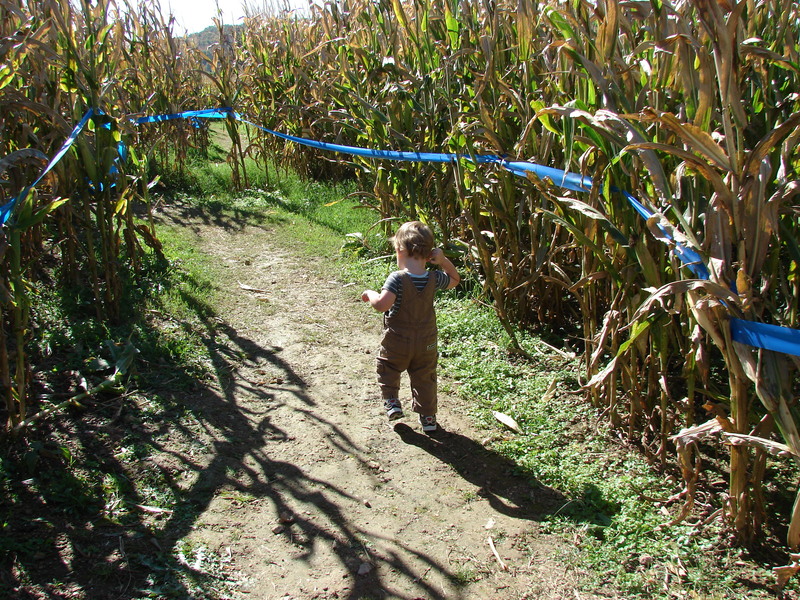 There were hay bales to climb, a corn maze (9 acres! 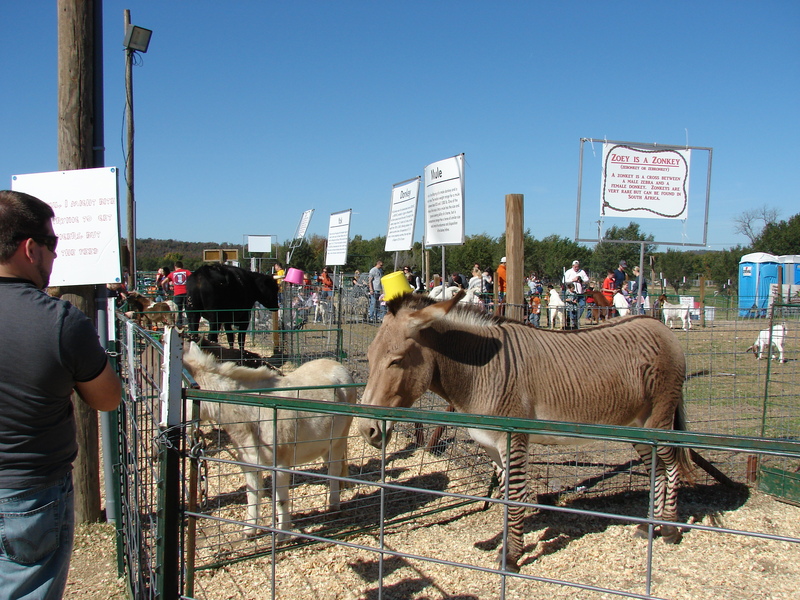 ), pony rides, a petting zoo, wagons to ride in, hay rides, pumpkin patch, and corn boxes (think sandboxes with corn). J was hesitant about the hay bales. They were a little too unstable for him, but he had a little bit of fun with daddy’s help. The corn maze was just way too long for all of us. It was getting close to lunch time and we had only made it 1/4 of the way through so we turned around. It was a very long and in-depth maze! J had the best time riding the ponies. They were hooked up to a round thing so even little kids could ride them as long as a parent was right there with them. J would just squeal and laugh. He didn’t want daddy to help him and didn’t like it when Chase would touch him to make sure he didn’t fall off. J had a good grip on the saddle and absolutely loved it! He ended up riding a pony twice just because we wanted to see him so ecstatic one last time before we left! 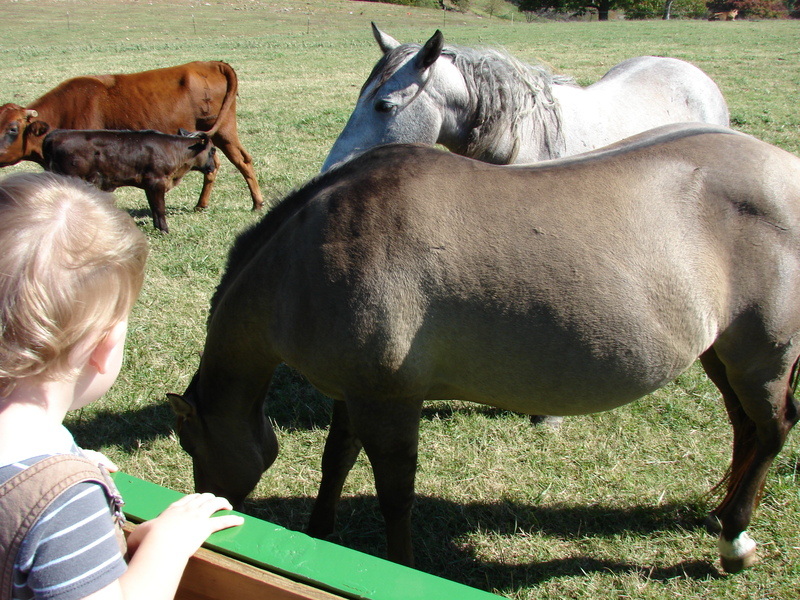 J also loved the petting zoo. He loves cows and they had some calves you could pet. J loved that! Another thing J loved almost equally as much was the hay ride. He loves tractors! He smiled and squealed the whole ride! On the ride we got to stop and feed chickens and cows. J was fascinated with chickens running around and the cows coming right up to us. We did let J in one of the corn boxes completely forgetting that one of his favorite foods is corn. He was probably thinking, “oh wow! Look at all this corn!” And as soon as he was in the box he popped one in his mouth! lol We got it out and took him out of the box. Hilarious! On our way out we got a little pumpkin for J. The morning was a blast! Saturday evening my aunt put together a Super Hero night at Chick-Fil-A. We stopped by there and had our pictures taken with Captain America and Spiderman. J was just staring at the decorations and the superheros. He seemed to have a lot of fun! On Sunday we had lunch after church with the family and just spent time together the rest of the day. We left to come back home on Monday. Unfortunately J woke up with a fever on Monday morning so he felt horrible all day. I know he was so glad to be back in his own bed. I was glad to be home too, and to get back into our routine. Make sure you take your children to the polls with you when you vote. My dad taught me all I needed to know about voting. I remember going to the polls with him at a very young age. I loved to go. Back then you stood in a booth and casted your ballot on paper with a pencil. The first time I went, I was so excited! You could vote for people, people’s names were on a ballot, and then that person could WIN. I remember when George Bush was running against Michael Dukakis in 1988. I was almost 6 years old. But more vividly, I remember when Bush and Clinton ran for president in 1992. I was 10 years old, and they had a mock election at school. I don’t remember who I voted for, but I remember being really excited that I got to “vote” just like dad. I think taking your child to vote with you gets them excited that one day they will be able to vote. I also think it is very important for them to see how you decide who you will vote for. I remember seeing my dad sit down at the table and read through different things about what or who he would vote on. My most vivid memory of the presidential election of 1992 was asking my dad who he was going to vote for. He told me he wasn’t telling. I remember being so upset that he wouldn’t tell me! And then he said something I will never forget. When you get to vote you don’t have to tell anyone who you vote for. It’s a secret. And you have the right to keep it a secret. The next time my dad voted and we stood in one of those booths, I realized that you can truly vote on any issue and for any person and not be judged by anyone, because no one has to know unless you want them to. Today you pointed at the door and looked over at me. I said, “door,” and then you said, “door!” I love that you are really picking up words so quickly now. Yesterday you actually said “please,” when I asked you to! I was pretty excited about that. You dropped your spoon in your lap during dinner and exclaimed, “oh goodness!” That made me laugh pretty hard. I had to tell your daddy about that! When you want Suzy to chase you, you figured out all you have to do is hold out food in your hand and then run away. It is so cute watching you laugh as Suzy chases you around the living room. You have the cutest little smile while you are holding out food for her and as soon as she comes near, you take off running while squealing very loudly! Hilarious! Yesterday when I put you down for your nap you were very wound up. In fact, as soon as I laid you in your crib you stood up and started playing. A few minutes later you were running back and forth across your crib talking and squealing. I couldn’t keep from laughing! And just when I thought you were entertaining enough, you started diving into your mattress and squealing at the top of your lungs. You saw one of your balls on the counter and you pointed to it and said, “get it, get it.” I asked, “what do you want?” like I had no clue. You then said “ball” about 6 times in a row. You were so excited about it! When you want to play ball or cars with me you usually hand me a ball or a car and then run over to the door. The entrance way is just long enough for us to roll a car or toss the ball back and forth. You sit down at the door and I sit on the other end. You love this. Naptime and bedtime usually get stalled a bit because we get so caught up in playing! I have a love/dislike relationship with rocking. I love rocking J before nap and before bed. He is so sweet when I am rocking him and when he is really tired he will rest his head on me, close his eyes, and completely relax. I love that. I love it when his little face is looking toward mine and he is in a completely relaxed state because his momma is holding and rocking him. I love when I think he might be going to sleep, and then all of a sudden he squints his eyes open just to look at me and gives me a big grin before he closes his eyes again. I love that rocking and holding my little man can soothe his fears, toothaches, or anything else. I tell myself how lucky I am that I am the one who rocks him before his naps. If I was working, someone else would be rocking him or he probably wouldn’t be rocked. That thought makes me sad sometimes. 1 year olds need some hugging/cuddling/rocking time too. It is so therapeutic for both parties. Are you wondering where the dislike of rocking comes in? I really don’t like rocking at 1:30 in the morning or 2:45 in the morning, or really anytime in the middle of the night when I was just dead asleep. It is SO hard to stay awake and really rock a baby or toddler when you are nodding off yourself. I’m thinking to myself, “How many more minutes does he need rocked because I am about to fall over in this chair.” There you have it. My nasty rocking confession. I don’t know how grandmas do it! They will gladly rock their grandchildren for an hour or even more at absolutely any time of the day! 12:35am sounds like a great time to rock their grandbaby if that’s what their grandbaby wants! Maybe it’s a grandma thing. But don’t get me wrong. I really do absolutely love rocking my sweet little boy. I thank God for him, and that I have this time to rock him while he is still little. And I am really trying to remember those feelings at 1:30 in the morning. Because, sometimes, it’s those 1:30 in the morning rocking chair cuddles that mean the most.